Please be advised that the access road was washed out in the spring of 2009. However, as of September 2012 the road was passable, but use caution as it could be unstable in wet weather. 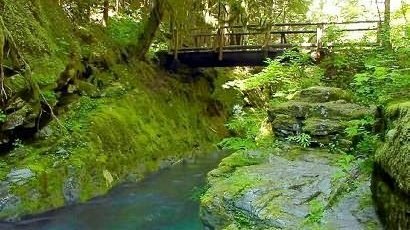 The hike up Siouxon Creek (pronounced Sou-sawn) can be a refreshingly pleasant walk along a beautiful mountain stream. The trail can be used by mountain bikers so be alert. All of the bikers I encountered were very courteous and respectful. From the trail head at the end of Forest Road #5701, the trail drops immediately toward Siouxon Creek in the valley below. The trail crosses a number of smaller creeks that flow into Siouxon Creek. Any of the streams of any size have excellent bridges. One of the fun things about this hike are the refreshing views around every bend in the creek. Siouxon Creek is wide and shallow in places and narrow and swift in other places. Then there are the falls along the way. Some of the smaller streams flowing into Siouxon Creek have falls that are visible from the trail, and then Siouxon Creek has falls of its own. Then at the end of the hike, you will cross Siouxon Creek on a very fine bridge and the trail splits. 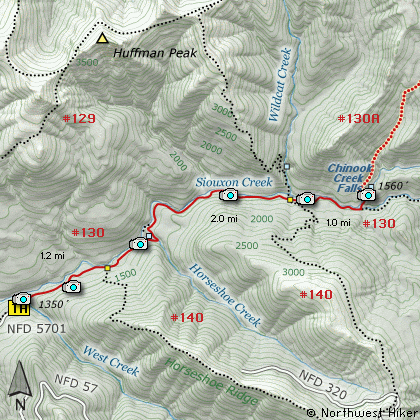 Trail #130 continues up Siouxon Creek, but follow Trail #130A up Chinook Creek for about a quarter mile to view the beautiful Chinook Creek Falls. From Woodland, WA travel east on the NE Cedar Creek Road for about 16.4 miles, and you will come to the junction of NE 221st Ave, which goes into the town of Amboy. Just keep straight ahead on the Cedar Creek Road and in another mile and a half you will join SR 503. Continue east on SR503 for another 2.2 miles to the junction of Healy Road. Turn right and head east on Healy Road for 2.3 miles where the road becomes Forest Road 54. Continue easterly on FR54 for another 6.8 miles where it intersects Forest Road 57. Bear left on FR57 and go another 1.2 miles where it intersects with Forest Road 5701. Follow FR5701 clear to the end where you will find the trailhead to this hike. Note that recently FR5701 was washed out by a slide, but it was passable at the time of this writing.